T-Mobile has promised it will take on cable firms as part of its latest attempt to woo regulators into authorising the Sprint merger. By Ryan Daws, 08 March 2019, 0 comments. Categories: 5G, Broadband, Connectivity, Consumers, Government, Industry, Infrastructure, Mobile, N America, Networks, Operators, Regulation, Wireless. 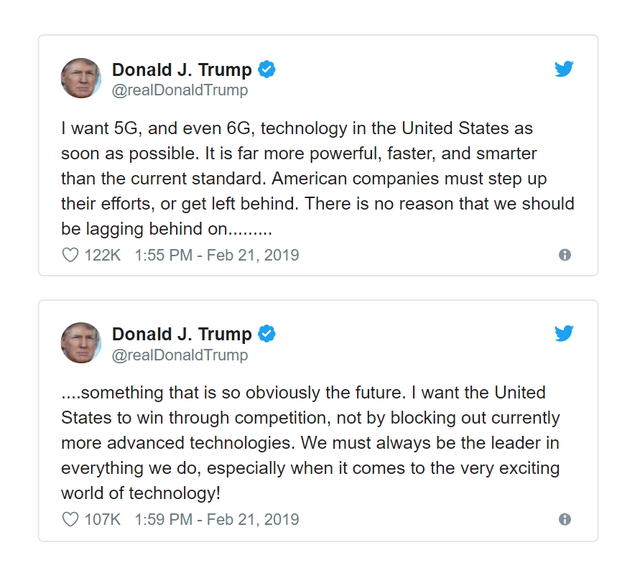 President Trump has been mocked for talking about 6G when 5G is just starting to roll out, but he’s right to be thinking about what’s next. 6G doesn’t exist in the slightest yet – you know that, and I know that. Who knows whether Trump is aware or not, but leaders are quite right to be giving it some consideration. By Ryan Daws, 22 February 2019, 0 comments. Categories: 5G, Connectivity, Government, Industry, Infrastructure, Innovation, Mobile, N America, Networks, Research, Standards, Wireless. By Ryan Daws, 22 January 2019, 0 comments. Categories: 5G, Connectivity, Industry, Innovation, Mobile, N America, Networks, Operators, Wireless. WiFi devices have used the WPA2 protocol for over a decade, but that will start to change as the WiFi Alliance begins WPA3 certification. WPA2 was launched in 2004 so, 14 years later, it’s ripe for replacement. The latest protocol adds several new protections. One of the major improvements aims to prevent hackers cracking the password by repetitively making guesses. By Ryan Daws, 26 June 2018, 0 comments. Categories: Connectivity, IoT, Security, Standards, WiFi, Wireless. The Wireless Broadband Alliance (WBA) has outlined requirements for cross-network IoT device roaming – while addressing the necessity to come up with a dynamic method for IoT devices to hunt for a computable network and automatically roam at scale without interruption. By Telecoms, 30 May 2018, 0 comments. Categories: Broadband, IoT, Networks, Wireless. Facebook has been talking about its gigabit WiFi project Terragraph since 2016, but we now have a partner and a date for trials. Terragraph aims to be an alternative to fibre broadband using 60GHz millimetre-wave wireless. It will use 802.11ay technology, designed to be the successor to 802.11ad wireless. By Ryan Daws, 22 May 2018, 0 comments. Categories: Broadband, Connectivity, Industry, Infrastructure, Networks, WiFi, Wireless. The global telecommunications industry is developing dynamically; the main players seek to expand the boundaries of development, to create more long-term and reliable relations between market participants and customers everywhere. By Suren Arustamyan, 19 March 2018, 0 comments. Categories: IoT, Operators, Wireless. SK Telecom continues to be at the forefront of next-gen technologies with the development of WiFi offering quadruple the speed of the current standard. By Ryan Daws, 23 October 2017, 0 comments. Categories: Broadband, Connectivity, Mobile, Standards, WiFi, Wireless. Researchers are proposing a floating antenna design to help alleviate overcrowding in the electromagnetic frequency spectrum and boost wireless signals. The researchers, from the ElectroScience Laboratory (ESL) at Ohio State University, are designing suspended high-gain millimeter-wave antenna arrays constructed through a combination of 3D printing and MEMS (Micro-Electro-Mechanical Systems). By Ryan Daws, 16 October 2017, 0 comments. Categories: 5G, Networks, Wireless. Nokia is using its experience as a telecoms vendor to help solve home WiFi problems with the announcement of a ‘carrier-grade’ system. By Ryan Daws, 09 October 2017, 0 comments. Categories: Broadband, Connectivity, Consumers, Fiber Optic, Operators, WiFi, Wireless. Commercial venues have certain basics they must offer to their customers. Heat, light and water are absolute essentials, but Wi-Fi is fast becoming a must have. It may seem glaringly obvious but offering your customers a slick, robust and free Wi-Fi experience is just as important as the environment, and the quality of service you provide. By Patrick Clover, 12 July 2017, 0 comments. Categories: WiFi, Wireless. Wi-Fi Alliance has launched a certification program, Wi-Fi CERTIFIED Home Design, which sets the guidelines to enable home builders provide an industry-approved network-installation plan. By Telecoms, 16 June 2017, 0 comments. Categories: IoT, WiFi, Wireless. Tech giants Ericsson and Cisco have extended their strategic partnership to include a new Wi-Fi solution offering called Evolved Wi-Fi Networks (EWN), the two companies have announced. The new Wi-Fi solution combines Cisco’s Wi-Fi portfolio with Ericsson's 3GPP access to provide reliable Wi-Fi connection with high performance to Ericsson's mobile, cable and other industries customers. By Telecoms, 06 January 2017, 0 comments. Categories: Operators, WiFi, Wireless.